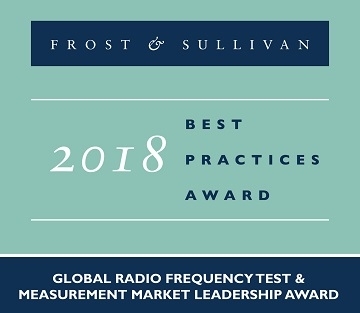 Frost & Sullivan has awarded Keysight with the 2018 Global Market Leadership Award for capturing 27.8% of the total market revenue in 2017. 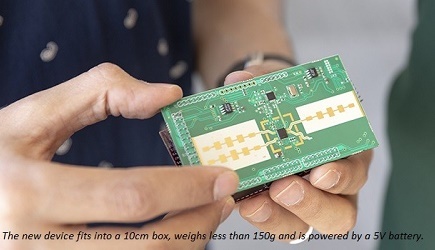 The company has been particularly dominant in the traditional instrumentation segment, with 34.5% of the revenue, and has become a leading participant in the modular instrumentation segment, with 24.7% market share. Keysight Technologies ascended to the top because of its diverse and deep product portfolio. The company's RF test equipment and software-integrated solutions address the challenges created by new, increasingly complex technologies. These solutions find application in every phase of the customer's workflow because they cover all types of instruments, including signal generators, spectrum and signal analyzers, network analyzers and emulation, and context instruments (power meters and electronic counters) in different form factors. Having operated for nearly eight decades in the RF T&M market, Keysight has a significant base of customers in the mobile communications and aerospace and defense industries that continuously demand new solutions to test the constantly evolving communication technologies. It is the only company in the RF T&M market that offers all form factors (traditional, modular, and portable) covering every stage of the product lifecycle, including simulation, research, development, design validation, manufacturing, and installation and maintenance. Looking to evolve from a hardware-centric company to a software-driven company, it launched a software design center in Atlanta, Georgia in 2016. In 2018, the company introduced PathWave, a design and test software platform that integrates the customer's workflow, from design to manufacturing. Even though hardware remains a critical focus in the RF T&M space, Keysight's strategy of focusing on software is a winning move because it endows the company to align with the industry's increasing focus on software. In addition to working closely with industry leaders to advance 5G, Keysight has been collaborating with automotive original equipment manufacturers (OEMs) and their suppliers to develop next-generation automotive technologies, especially those related to the connected car and autonomous driving concepts. In line with this goal, Keysight opened its Automotive Solution Center in Detroit, Michigan, in November 2017. Each year, Frost & Sullivan bestows this award upon the company that demonstrates excellence in customer value. Attaining loyal customers that become brand advocates allows the company to achieve and maintain a market leadership position. By committing to the customer at each stage of the buying cycle and continuing to nurture the relationship, the company is recognized with this award for its market leadership position over time.